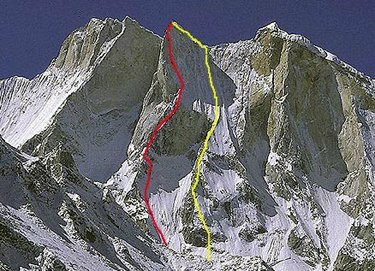 American climbers Conrad Anker, Jimmy Chin and Renan Ozturk have become the first in the world to conquer the Shark’s Fin – a lethal 20,000ft pinnacle. Conrad Anker, Jimmy Chin and Renan Ozturk spent 12 days scaling up the jagged near vertical point on Meru Central in the Himalayas. Dubbed one of the hardest climbs in the world, dozens of professional climbers had been defeated by the tricky summit – with one breaking both legs during an attempt. But the American climbers successfully negotiated the 20,700ft climb – sleeping in a hanging tent thousands of feet above the ground.